The Rockefellers Irish silver made exceptional prices in the exceptional sale of the Peggy and David Rockefeller collection at Christie’s in New York last night. The running total on day three of the sales is now an astonishing $828,043,219. 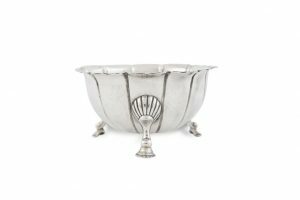 Yesterday the Coghill Monteith, a William III Irish silver monteith (a bowl used for washing wine glasses) by Thomas Bolton of Dublin sold for $137,500 and a George II Irish gold freedom box made by William Currie of Dublin sold for $47,500. 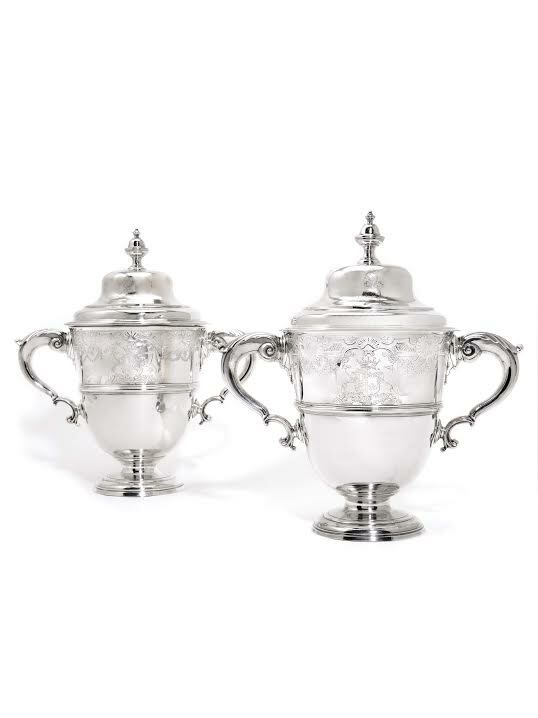 A pair of Irish silver sauceboats by Charles Townsend, Dublin made $15,000 and a set of four Queen Anne Irish small silver strawberry dishes by John Ricketts, Cork sold for $16,250. 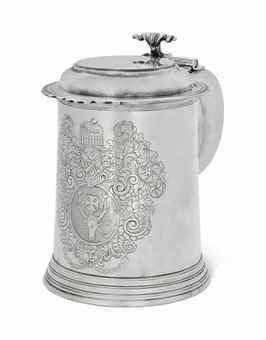 Among the other pieces of Irish silver in the collection was a George II Irish silver coffee pot by William Townsend which made $16,250. 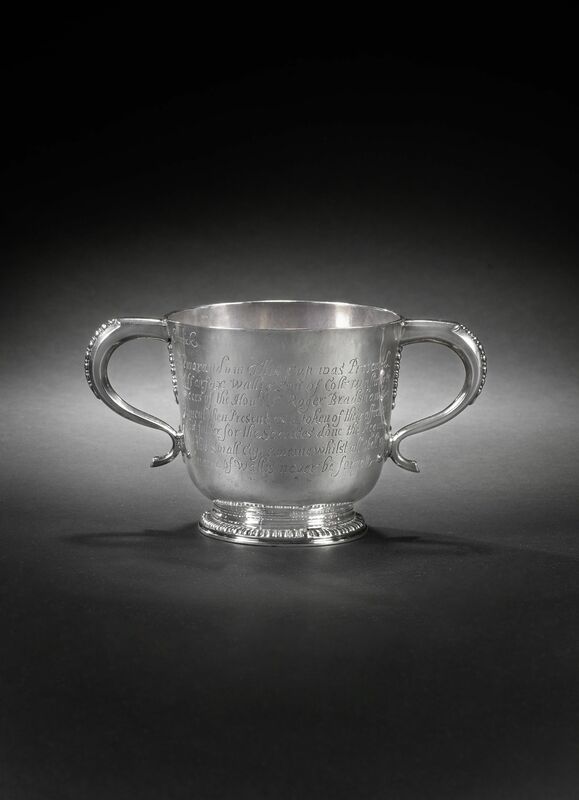 This two handled Irish silver cup was a 1940 wedding gift to David and Peggy Rockefeller from Mr. and Mrs. Henry Ford of Dearborn, Michigan. It will come up at Christie’s in New York on May 10 as part of Christie’s auction of the Collection of Peggy and David Rockefeller. The sales of approximately 1,550 auction lots includes one of the largest and most important collections of decorative arts to come to market in decades. Around 900 lots will come up at the New York saleroom on May 8, 9 and 10 and there will be a companion online sale of 650 lots to open worldwide on May 1. A number of philanthropic causes are to benefit from the auction. 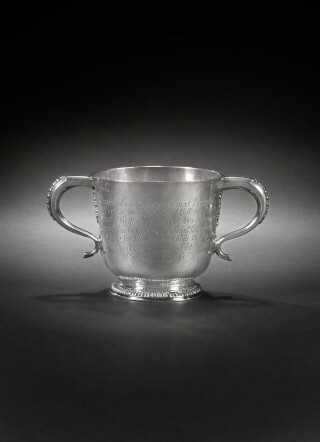 The silver cup, with the mark of Robert Calderwood, Dublin c , is estimated at $2,000-3,000 dollars. Banker and philanthropist David Rockefeller, who died last year aged 101, was chairman of Chase Manhattan Corporation. His wife, the former Peggy McGrath, died in 1996. They had six children. 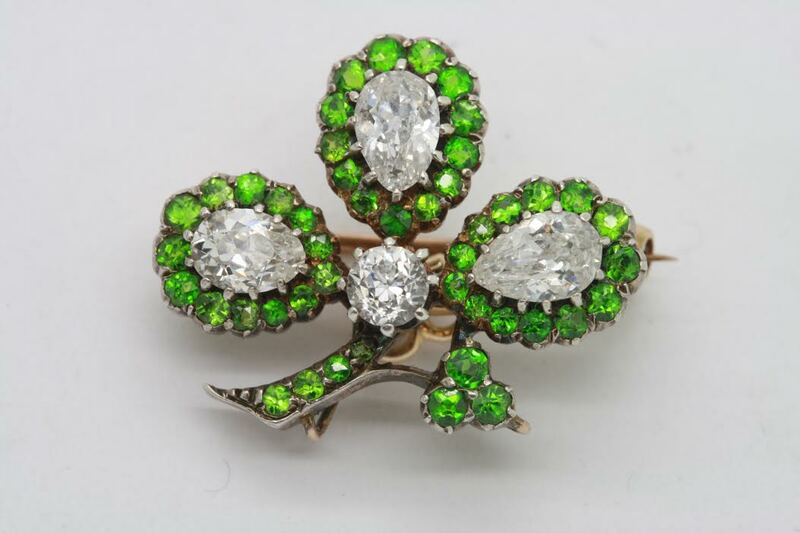 MORE than 180 lots of rare Irish and English silver from the collection of Jimmy Weldon will come under the hammer at James Adam in Dublin on May 16. On offer is a selection ranging from the rarest of Irish provincial spoons to quirky table decorations. 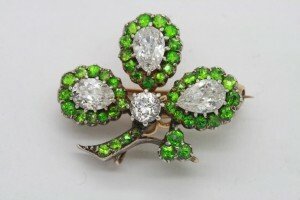 Provincial Irish silver is rare and prized nationally and internationally. 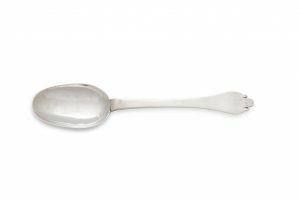 The highlight of the sale is a Kinsale silver trifid spoon made by brothers William and Joseph Wall around 1712. It is estimated at 8,000-12,000. There is a similar estimate on a fluted Limerick sugar bowl made by Collins Brehon around 1750. A second piece of Limerick silver is a c1785 soup ladle by Maurice Fitzgerald (4,000). A gold Claddagh ring made c1775 in Galway has an estimate of 3,000. There are a number of pieces of Georgian Cork silver from makers like Carden Terry and Jane Williams, Michael MacDermott, John Nicolson, William Reynolds and George Hodder. Major Dublin pieces from the early 18th century include a 1737 globular tea kettle on stand by Thomas Sutton and a 1715 strawberry dish by John Hamilton. There is a collection of four early 19th century seals with the armorials of the 7th Viscount Powerscourt. He was responsible for the remodelling of Powerscourt and laid out the gardens as we know them today. The seals are estimated at 8,000. Weldon’s was established in Clarendon St. in central Dublin in the 1890’s. In the 1960’s Jimmy Weldon joined the business founded by his grandfather. A genial expert on Irish Georgian silver who has served twice as Master Warden of the Worshipful Company of Goldsmiths. The two day National Antique, Art and Vintage Fair is at the South Court Hotel today and tomorrow. 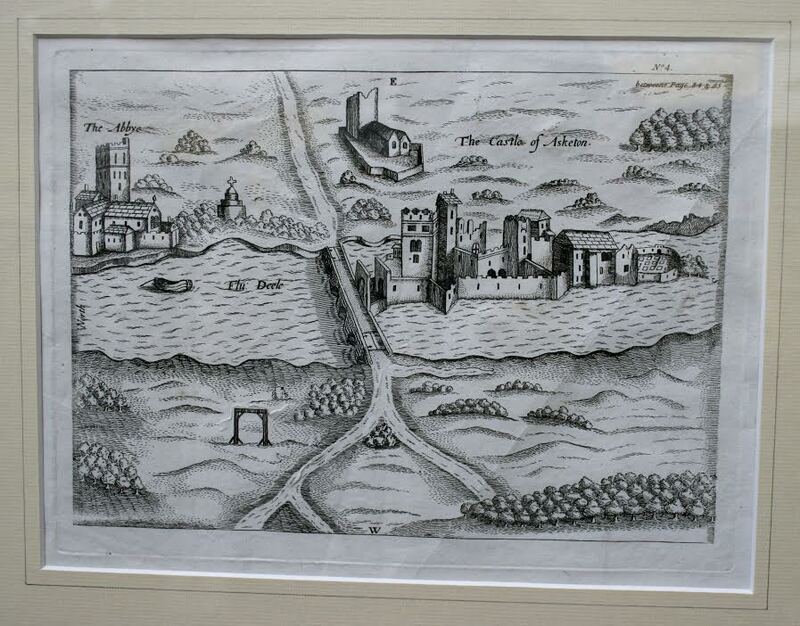 Silver on offer includes a pair of Limerick buttons c1780 by George Moore and a pair of Cork buckles c1785 by John Warner at Weldons, Celebration in White, an oil by Mark O’Neill at Treasures Irish Art of Athlone and an oil on canvas by Erskine Nichol at George Stacpoole of Fr. 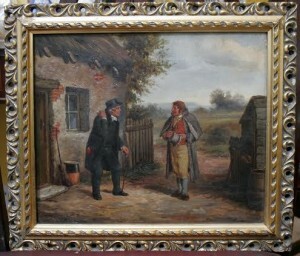 Tom and Myles, a scene from The Colleen Bawn by Dion Boucicault. A member of the Royal Scottish Academy, Erskine Nichol taught art in Dublin from 1845-50 during the Famine. 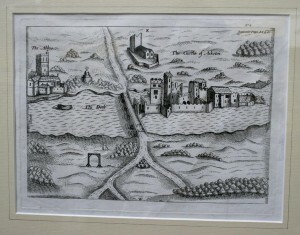 Another rarity at George Stacpoole is an Askeaton print from T. Stafford’s Pacata Hibernia 1633. There is 18th and 19th century furniture, Victorian and contemporary art, jewellery, rare books, crystal, watches, stamps, coins, banknotes, train sets, tin plate toys, Star Wars posters, militaria, fishing tackle, porcelain and Waterford crystal are among the thousands of items on display. Cork, Limerick and Dublin silversmiths will feature at Woodwards bi-annual auction of silver and art in Cork on November 11. 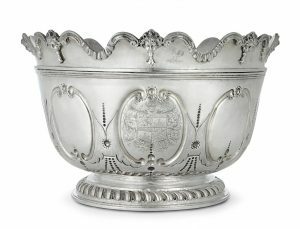 Highlights include a c1750 Limerick Georgian silver French style serving spoon by Samuel Johns (3,000-4,000) and a Cork silver dish or potato ring by William Egan 1916 (1,500-2,000). There is a George III bright cut Limerick silver serving spoon by Patrick Connell c1785 (1,000-1,500). Cork made pieces include a pair of c1827 George IV cream or sauce ladles by Richard Garde (300-500), a bright cut serving spoon in the neo-classical style by Joseph Gibson c1790 (100-150), a sugar bowl with Celtic design band and Sword of Light hallmark for 1966 by William Egan (80-120) and a sugar tongs with fiddle pattern handles by Carden Terry and Jane Williams with Dublin hallmarks for 1813 (50-100). A Limerick Georgian serving spoon by Samuel Johns c1750 (3,000-4,000). 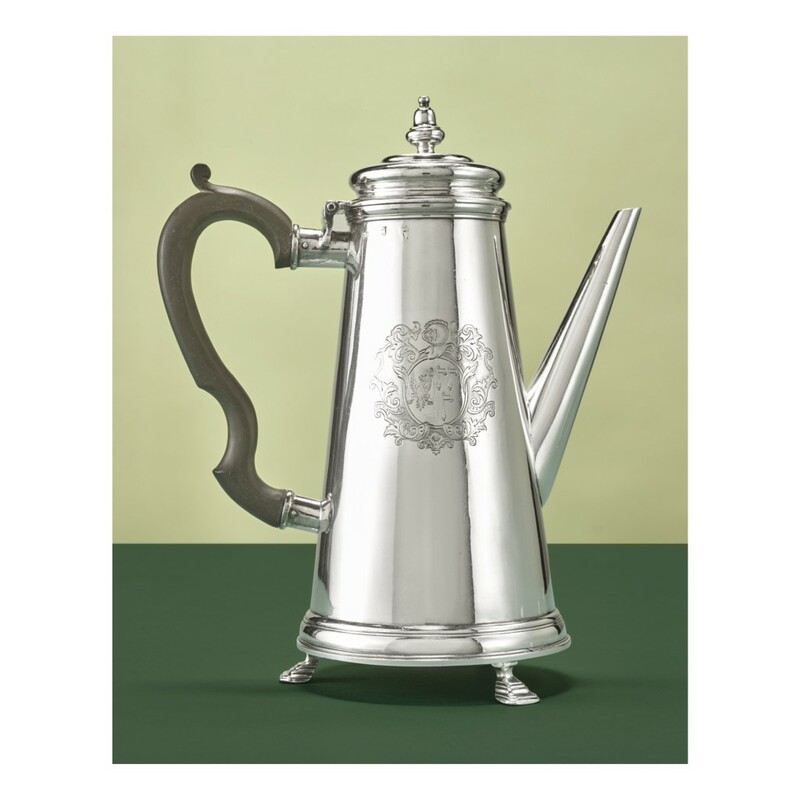 A Queen Anne Irish silver tankard comes up at Christie’s Country Home sale in South Kensington, London on July 7. Estimated at £8,000-10,000 it was made in Dublin in 1702. 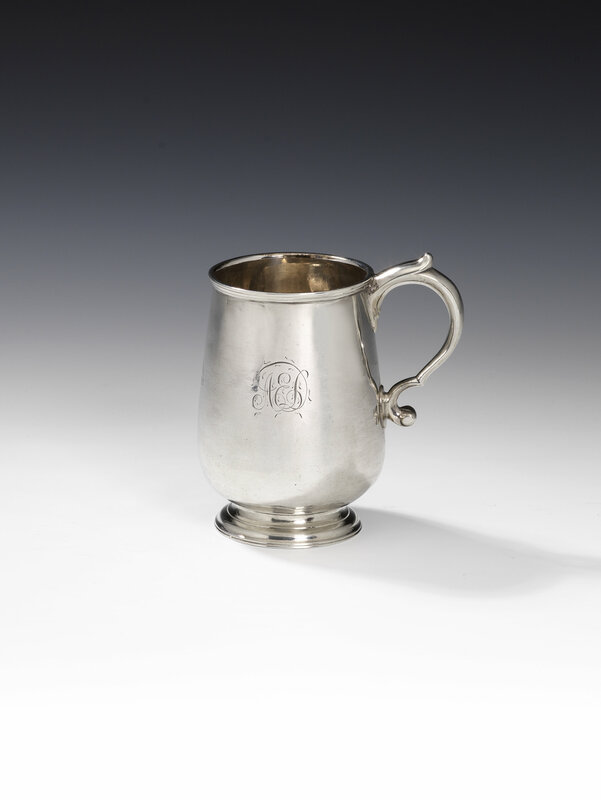 The tankard carries the mark of David King, Dublin 1702 and the handle has the mark of Edward Workman of Dublin. The front is engraved a large contemporary coat of arms for Hartwell. 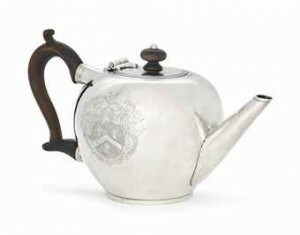 A second Irish silver lot in the sale is a George I bullet teapot with the mark of Matthew Walker estimated at £4,000-5,000. Made in 1717 it has been dechased. 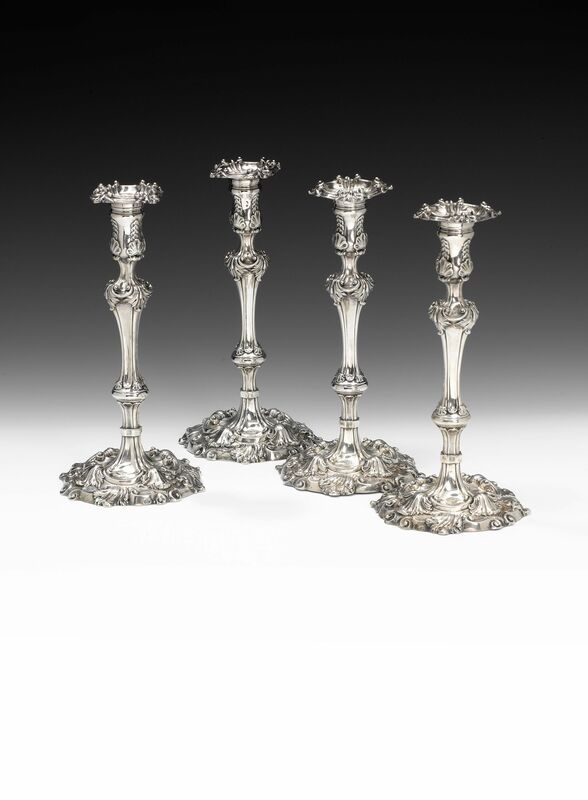 Irish silver sold particularly well at Sotheby’s Mansion – Private Collection sale in London on April 28. 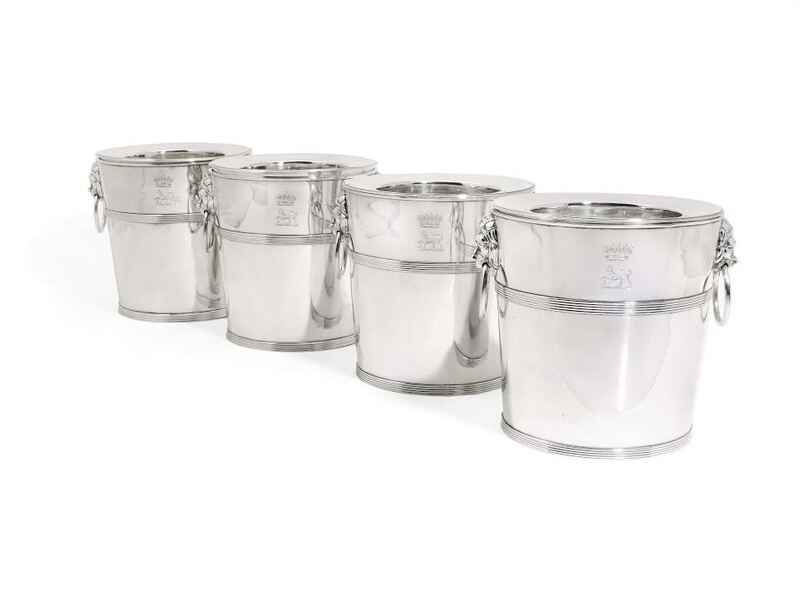 A set of four George III Irish silver wine coolers by Thomas Johnston Dublin 1795 sold for £50,000 over an estimate of £25,000-35,000. 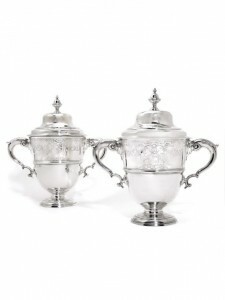 Two fine matching Irish George II silver cups sold for £35,000 , within the estimate of £30,000-50,000. One was by Robert Calderwood and both were made in Dublin in 1736 and 1739. 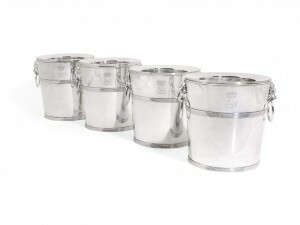 A set of four George III Irish silver wine coolers, Thomas Johnston, Dublin, 1795 sold for £50,000. Two fine matching Irish George II silver cups and covers, one Robert Calderwood, both Dublin, 1736 and 1739 sold for £35,000. Later chased Dublin George I 1714 teapot no maker’s mark. Buyers of more valuable pieces of Irish silver ought to be aware of a trick used by light fingered scammers. It revolves around the perfectly legal practice of de-chasing. 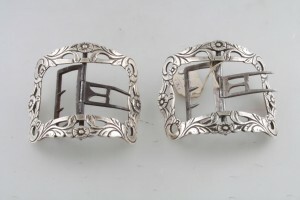 In Victorian times repousse (embossed) decoration was fashionable. 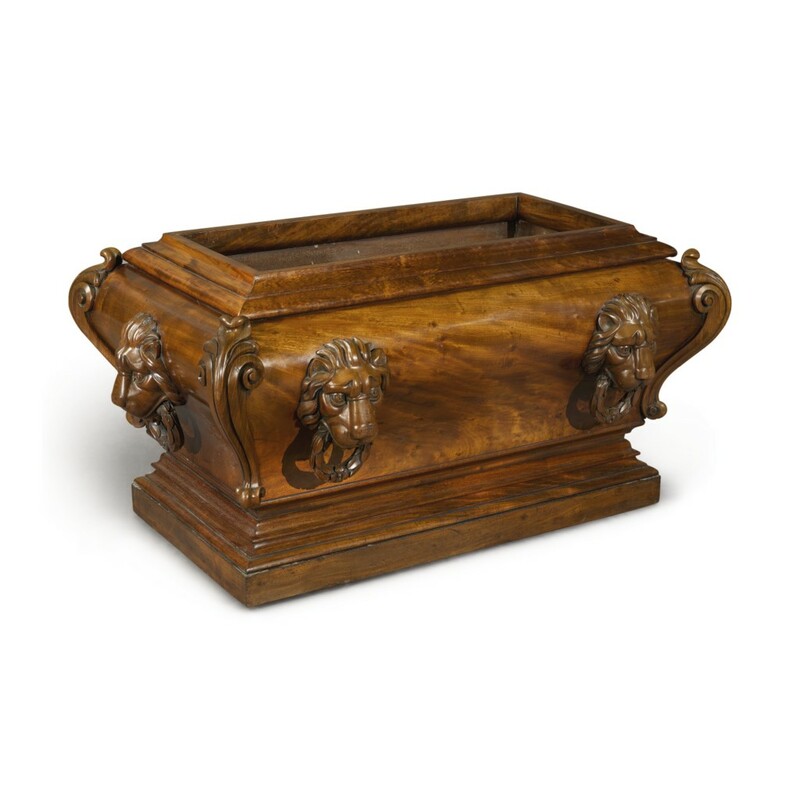 The Victorians chased older pieces – such as a plain, classical Queen Anne piece, in pursuit of fashion. Why? Because it was cheaper to decorate an existing piece than get a new one made. Consequently the integrity of the piece was devalued. The very small supply of Irish silver creates a constant hunt by international dealers to find later chased pieces and dechase them. This practice adds huge value of perhaps up to ten times the original cost. International standards dictate that when a piece is dechased it has to be labelled as such. These pieces are not permitted to be offered for sale at top international antique fairs. Sadly this practice has not been enforced in Ireland. 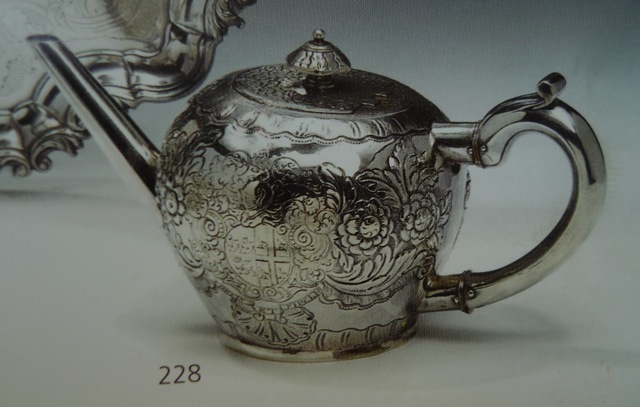 Buyers of significant plain pre 1750 Irish pieces do need to be aware that collectibles like bullet shaped teapots, bowls, beer jugs and coffee pots may have been dechased and not labelled as such. It is profitable for the unscrupulous to do this when silver work is early and has good hallmarks. Dechasing can degenerate into downright deception when crests, weights and shapes are changed. 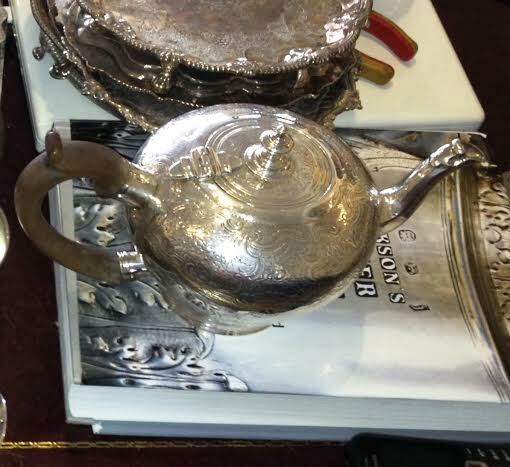 It is illegal to add a new piece of silver such as a spout without having the new addition hallmarked. 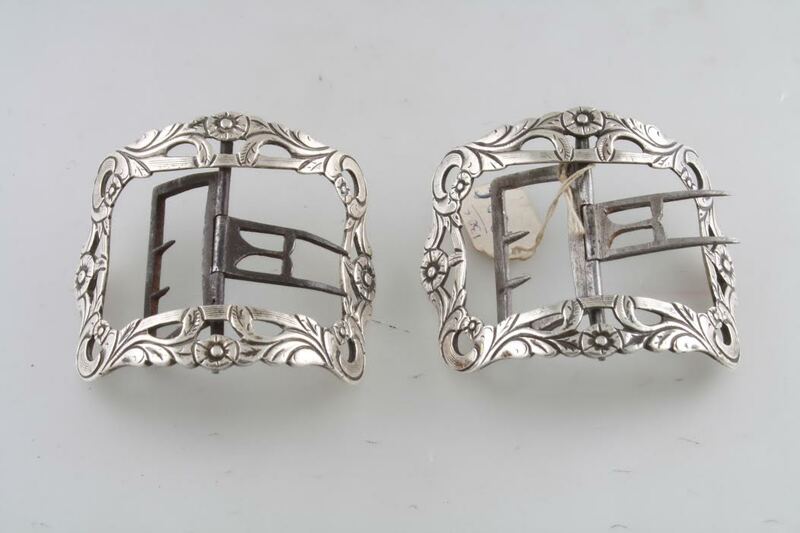 One Irish silver dealer, outraged at the practice, said that anyone with any doubts about a piece should have it vetted by the English plate committee as they possess the experience and knowledge to detect alterations. 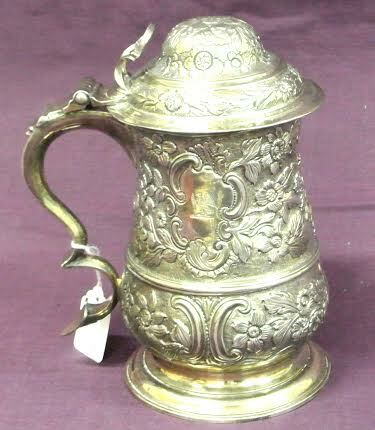 The vast majority of dechasing is carried out by British silversmiths. Sadly in the world of antiques, art and collectibles anything valuable will have been forged, imitated and copied. The difference between restoration and re-construction is blurred and causes problems in in many fields. The old adage “caveat emptor” – buyer beware – always applies. Examples of the sort of silver which might be dechased are illustrated. 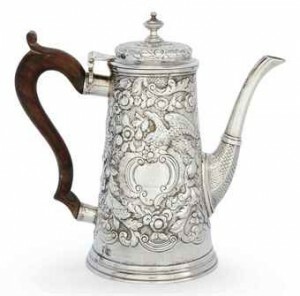 Later chased Dublin Geo II Coffee Pot by William Williamson 1745. 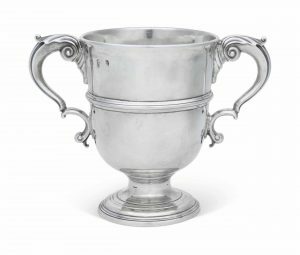 Irish silver exhibited at the Museum of Fine Art in Boston in 1963 is to come under the hammer at Bonhams in London on November 23. It is being sold to benefit Milton Academy, the school in Massachusetts attended by Senators Robert and Edward Kennedy, the Anglo American poet T.S. Eliot and the singer–songwriter James Taylor. The silver was shown as part of the Eire Society of Silver display in Boston. Among the most important items are a George II mug, by Mark Fallon of Galway (£12,000-15,000); a set of four George II candlesticks from 1750 by Robert Calderwood, previously in the collection of Earl Fitzwilliam (£6,000-8,000) and a Queen Anne two handled cup, Limerick 1707 (£4,000-5,000). 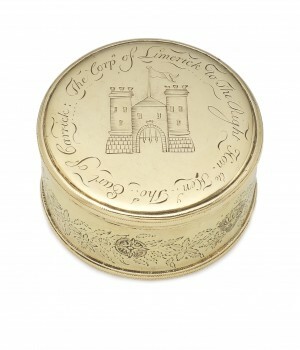 The sale also includes a gold Freedom Box (£20,000-30,000) presented by the Corporation of Limerick to the Earl of Carrick. Milton Academy has been rated by the Wall Street Journal as one of the top 25 schools in the world for preparing students for university and is traditionally seen as a feeder school for Harvard. The Kennedys were students here during the 1940s. The silver was given to the Academy and they have been permitted to sell it to raise funds. A set of four George II Irish silver candlesticks £6,000-8,000. (Click on image to enlarge). UPDATE: THEY MADE £12,500. A George II Irish silver mug, by Mark Fallon of Galway £12,000-15,000. (Click on image to enlarge). UPDATE: THIS SOLD FOR £15,000. 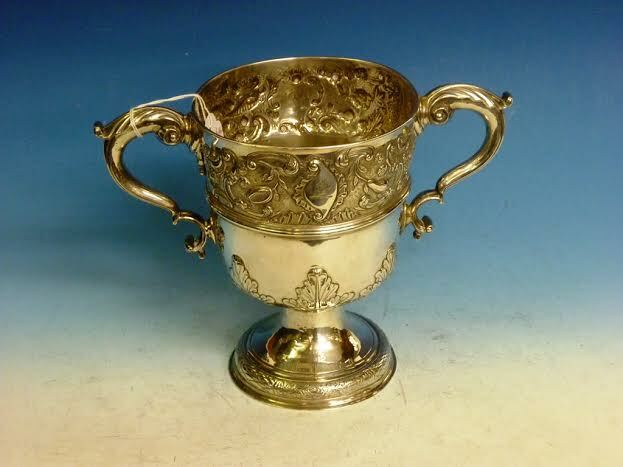 A Queen Anne Silver two handled cup by James Robinson of Limerick, circa 1707 - £4,000-5,000. (Click on image to enlarge). UPDATE: IT MADE £13,125. 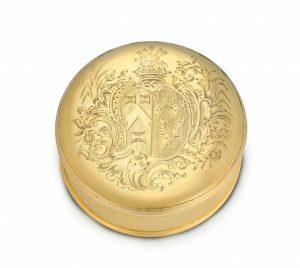 A Gold Freedom box, possibly by Samuel Reynolds £20,000-30,000. (Click on image to enlarge), UPDATE: THIS MADE £25,000.